We love our pets! Right now, we are down to two dogs, Lacey, a buff Cocker Spaniel, and Rascal, a Yellow Labrador Retriever. 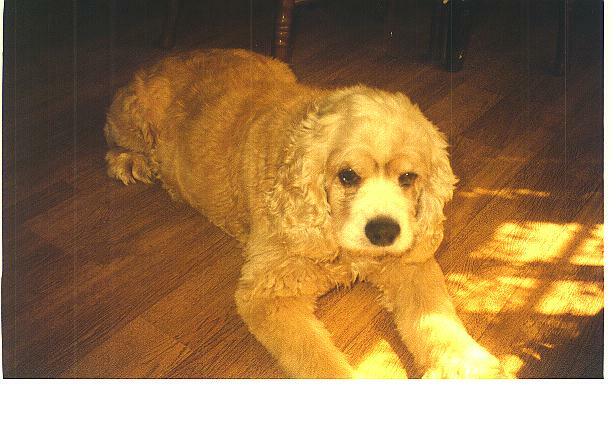 My Honey, who went to Rainbow Bridge in April, was also a buff Cocker Spaniel. Right now, I don't have any pictures of Rascal, but as soon as I do have some pics, I'll be putting them on this page, too! Honey was the best Christmas present my husband ever gave me! Now, if my husband had asked me ahead of time if I would like to have a house dog, I would have said, "NO WAY, JOSE!!" But, when he walked into the house a couple of days before Christmas and handed that little ball of fluff to me, my heart just melted. Honey was very special to me. He was totally mine, or I was totally his...I'm not sure which. Anyway, he was the smartest pet I've ever had. He was completely housebroken by the time he was three months old. He knew all his toys by name, and every toy had its own specific name. The first thing I taught him was to sit in a child's little red rocking chair. When we had company, he would go climb up into the chair (even after it got to be a tight fit!) and sit there, looking as though he was about to participate in the conversation. He loved to ride in a car or truck. He would get so excited when I got his leash out. If I asked him if he wanted to go "Bye-bye", he would be out at my truck in a flash, anxiously waiting for me to open the door. One of his tricks was to get a ball and drop it into the laundry basket as I folded clothes. I would throw the ball, and he would retrieve it and drop it back into the basket. I could ask him what he wanted, and he would always show me. If he wanted his supper, he would go to the door of the utility room (where I keep the dog food); if he wanted to go outside, he would go to the back door; but usually, he wanted a dog biscuit, so he would go to the pantry. I would get the treats, and he would then shut the door for me. A couple of years ago, I decided that he was "snacking" entirely too much, so I started telling him, "No!" when he came to beg for a treat. Well, that lil' bugger figured out how to get me to give him a treat! He would come to me and start whining or barking, and then run back toward the back door. Well, naturally, if he needed to go outside, I was going to let him out! So...I would get up, go open the back door, and Honey would sit there...just for a minute; then, he would whirl around and run to the pantry, as if to say, "Since you're up, how about getting me a treat?" LOL! Oh, yeah!! 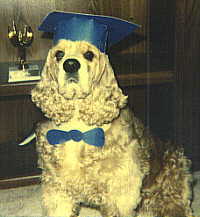 As you can see in the picture above, he graduated first in his obedience school class! You can see his trophy on the shelf behind him. I made him a mortarboard and collar for the occasion, and he proudly wore them! He seemed to love getting his picture made, as he would sit quietly until I was finished taking his picture. Also, as you can see in the next photo, he would play the piano, too. 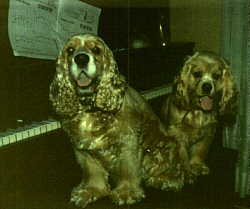 Sadly, Honey went to "Rainbow Bridge" on April 9, 2002. That was a really sad day for me, but I try to remember that I had 13 and 1/2 years of wonderful companionship from my Honey. I'll always miss him! Honey enjoying a spot of sunshine. Honey and Lacey are ready to entertain us! In the picture above, Lacey is on the right. She is not as "intellectual" as Honey, but whatever he did, she would mimic. She is a sweetie, and is now 12 years old. She is in excellent health, although she no longer has any eyes. She went blind from cataracts a few years ago. Last year, she developed glaucoma, and the pressure was causing her pain and threatening to rupture her eyeballs. Eyedrop therapy didn't help, so we decided the kindest thing to do would be to remove her eyes. So, she has gone from looking like an alien dog with white eyes (from the cataracts) to having a "blank:" face. She gets a lot of "double-takes" from people who have never seen her before! Lacey was a year old when I got her. Right away, she decided to let Honey know who was boss! She usurped his place on the foot of my bed and appointed herself to be in charge of keeping my feet warm at night. Even though she's blind, Lacey gets around pretty well. We won't be rearranging the furniture in the den, our bedroom, or the dining area while we still have her, as we don't want her to run into stuff anymore than she already does. She gets into a big hurry sometimes and has gotten some pretty hard knocks on the head from running into chair legs. She doesn't go far from the back door, and manages to find her way around the yard pretty well. She has an EXCELLENT sense of smell! She can smell something to eat 3 feet off the floor, and will usually figure out how to get it! When we start cooking, you can bet tht Lacey is going to be right there underfoot, just waiting for us to drop something yummy! Sadly, Lacey appears to be losing her hearing, as she is increasingly having difficulty discerning from which direction our voices are coming, and we have to call her several times to awaken her from sleep.